Are you allowed to answer “Amen” to Kaddish or Kedushah, if you are still in the middle of your own Shemoneh Esrei? 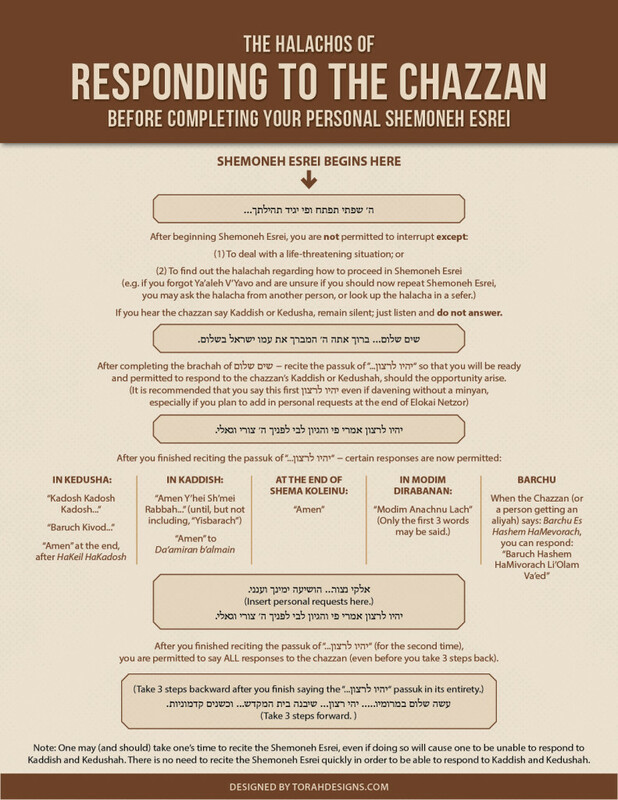 This chart outlines when you are, and are not allowed to respond to the chazzan before completing your personal Shemoneh Esrei. If you hear the chazzan say Kaddish or Kedusha, remain silent; just listen and do not answer. אלקי נצור… הושיעה ימינך וענני. After you finished reciting the passuk of “…יהיו לרצון“ (for the second time),nyou are permitted to say ALL responses to the chazzan (even before you take 3 steps back). Note: One may (and should) take one’s time to recite the Shemoneh Esrei, even if doing so will cause one to be unable to respond to Kaddish and Kedushah. There is no need to recite the Shemoneh Esrei quickly in order to be able to respond to Kaddish and Kedushah.